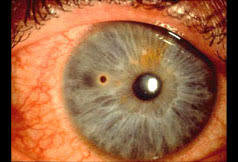 Foreign object in the eye is something that enters the eye from outside of the body. It can be anything from dust particle to a metal piece. The foreign object mostly affects the cornea (Cornea is the transparent outer layer of your eye) or the conjunctiva (Transparent membrane that covers the outer surface of your eye along with the inside of your eyelids). Many times the injuries due to foreign objects are minor, but sometimes they can cause infection or damage to your vision. Here we present a case of Mr. Ram Prasad, 32 years old, who met with a bike accident, which didn’t cause harm to his body, but few sand particles entered his eyes giving irritation in his eyes, which was followed by redness and excessive tearing. Assuming it to be a very minor accident, he just rinsed his eyes with water and went home. By late evening he felt discomfort in his eyes and his eyes were oedematous (Swollen), he felt that something is still there in his eyes which he can feel which was making it very uncomfortable for him. He rinsed his eyes frequently with water, but found no relief. So he decided to consult an eye specialist. Mr. Ram’s mother had got her treatment done at Advanced Eye Hospital and Institute (AEHI) in the past, located at Sanpada, Navi Mumbai, so he was aware of the hospital and took an appointment at AEHI. On reaching AEHI, he got his eyes examined in the optometry department by various machines. Then he had his consultation with Dr. Vandana Jain, Cornea and Cataract specialist. Dr. Vandana Jain examined his eyes and found few sand particles in his eyes. 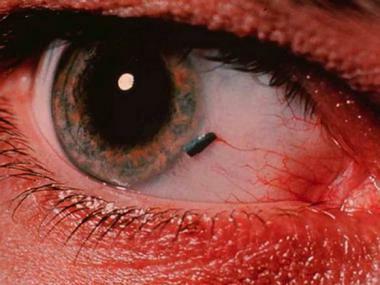 She carried fluorescein dye test (A fluorescein dye is used to visualize the blood blow in your retina and choroid). 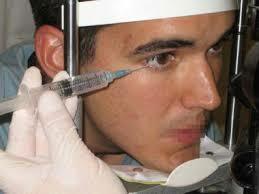 With the help of some instruments and needle she removed the dust particles in his eyes and flushed with water. Further she administered some antibiotic eye drops for healing of his eyes, and to prevent further infection. On the next day he was much better. The swelling and redness were reduced. The pain in his eyes was reduced. Mr. Ram was happy for his decision to visit Advanced Eye Hospital and his consultation with Dr. Vandana Jain. · Do not rub the eyes which can cause further scratches in your eye surface. · Wash your eyes with clean water.